The basic system is to choose between 2 forms. One is the round toe (ES) which easily suits any occasion. The other is the more stylish and trendy chisel toe (CS). The basic system is composed of abundant variations, imagined in a variety of settings, of carefully selected leather tanned domestically. The concept is that it be used lovingly for a long time. From calf to kip, smooth, nap raising, oil, embossed. We have also assembled a large range of colors. It is possible to enjoy the conception of different parts composed of different materials. It is also possible to customize models by ordering from stores where our products are handled. The basic system is to choose from our ES Product Samples or CS Product Samples. Be careful as there are different designs for Round (ES) and Chisel (CS). Imagine the occasion - formal, dress-up, dress-down, casual up, casual down, and enjoy thinking about the appropriateness of the material. The item names have been named after various persons who have participated in their manufacture. We respond to desires for partial changes and for designs not in our samples. (Delivery and price are separate necessitating consultation.) It is also possible to customize models by ordering from stores where our products are handled. In these cases, we will name item name after the orderer. 1. First of all, we get a firm grip of the customer’s precise foot length. We recommend the use of a measuring apparatus. Extending the toes greatly gives us the greatest numerical value for foot length. 2. Next, we choose 2 to 4 pairs of gauge shoes of greater length than the customer’s and the closest to their foot width, and actually have them try them on. Absolutely do not make an easy-going decision at this time. Rather, we recommend that both a little tight and a little loose ones be tried. It’s important that the customer gets a feel for both. 3. The gauge shoe that fits the customer best to a tee is tried on both feet. By walking around the shop in them for a few minutes, one can check the feeling to the finest details. *Although there are almost no problems with designs with laces, we recommend that customers who choose a slip-on type other than monk strap try a width one size smaller. 4. If there is a part that hits the tips of the toes, we place an instep. We check whether it should be a 1mm or 2mm placed instep. 5. We enter the customer’s left and right length and width, and the points for the placed instep in the order form. 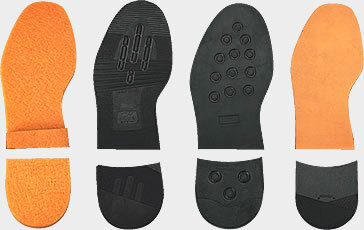 Both the fashion element and the function element are very important when selecting a sole. There are 4 variations in the basic system. We recommend a real leather sole. It is of course difficult for it to get moldy, and surpasses all others in the feeling it gives conforming to the feet as it is worn in. Also, the resonance of the sound it makes as you walk produces an emotion impossible to put into words. However, it has its faults such as being easy to shrink and easy to slip after being worn in the rain. Considering these points, we prepare difficult to shrink and slip heels made by Italian Vibram company. In addition, we prepare dienite pattern soles made from composite rubber that are easy to match to dress, as well as the pre-eminently strong against slipping rice-bran ceramic inclusive (patent pending) original sole, and the crepe sole with the flavor of natural rubber. The various heels are made of the same materials. For example, one may want to increase the thickness of the sole. Or you may want to have a heel like the one shown in the picture. (Delivery and price are separate necessitating consultation.) It is also possible to customize models by ordering from stores where our products are handled. There are 3 choices. Please refer to the pictures below. The basic system is the brand “ ” which means in English “Respectfully made ordered shoes/ Japanese made good shoes”. Another choice is to get the house brand of the store where they are handled. In this case, a separate cost becomes necessary for the branding. Moreover, the customer’s name can be embroidered in either Chinese characters, initials, or roman letters. (This option involves extra cost). There are 3 colors to choose from in the basic system. In the basic system, length and color are determined by the design and leather material. You can choose between low pulling round laces or flat laces. Color can be chosen as an option for no extra cost. Please consult us if you have a preference for a certain material. In the basic system, color matching is determined in regard to the upper sewing machine stitch. The outer thread is chosen from black, dark-brown, light-brown, or white depending on which color is closest. If as is the case in the picture, you choose white thread to match dark leather, please advise. (Option for no extra cost). Copyright (c) 1999 Miyagi Kogyo Corp. & One's Co., Ltd. All Rights Reserved.